Last week www.cruise.co.uk, the web site cruise booking agent that sprang from Victoria Travel, released its latest cruise line survey, but it must be said that some of its results are highly dubious. For example, for "best cruise line" the ranking was Cunard, Thomson, Ocean Village and Princess. No mention at all of Crystal, Regent, Seabourn or Silversea. Since when did Ocean Village become the third best cruise line in the world (or even in the UK)? Let's look at some of the results. There will be and has already been a lot of controversy over the way these results have been expressed. This is mainly because the survey only counts lines and ships that have received a significant number of reviews, which in itself is flawed because by sheer numbers of passengers it leaves out the best ships in favour of mass market ones. How anyone might accept that Thomson could ever be the second best cruise line and that Ocean Village ties with Princess for third is ludicrous. Thomson and Ocean Village are of the tour operator bucket and spade brigade with flights to Palma included. And Ocean Village has failed within the Carnival stable because it tried to compete with a tour operator with its own airline. Surely "best" is not the way to decribe these results at all. "Most popular" would be more like it in the real sense of that word. There are many many ships missing from this list, indicating quite a restricted sample. While supposedly it is valid for a UK market, this is probably not the case as the more upmarket lines that are all missing make up a large part of their clientele from the UK as well. Outside of North America, after all, the UK is the largest market in the world. Queen Mary 2 has been in service for five years now but Celebrity Equinox has only just entered service, so how she came to feature in this list has not been explained. Again, surely "most popular" is the true description of these results and not "best" at all. Now just who is going to believe that the Thomson Celebration really has the best food in the world of cruising? Again, perhaps most popular amongst the little Englanders that participated in the survey. How terribly flawed this result is is quite evident here. While it is commendable on Thomson's part that they can come up with such a result, is it really true that the three ships with the best service should all be operated by the same tour operator? Where are Crystal and Regent and Seabourn and Silversea, not to mention the German operator Hapag-Lloyd Cruises? This may be the closer to the truth in that both P&O (on their family shisp anyway) and Royal Caribbean probably do offer the best ships for families. Possibly MSC Fantasia if one considers her Yacht Club, but again where are Crystal, Regent, Seabourn and Silversea? Again, most popular would again describe this survey better than best and its proponents are twisting the truth by saying these are the "best" in the world of cruising. In summary, it is obvious that this method of scoring cruise ships is highly flawed. 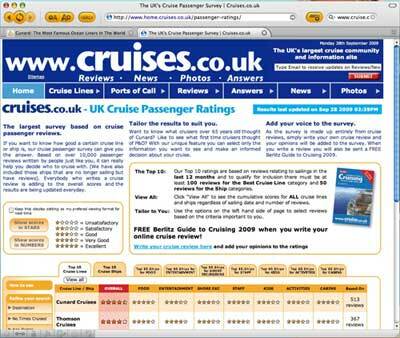 It seems to be an effort by www.cruise.co.uk to develop publicity and drive traffic to its own site. The site now counts more than 51,000 reviews and gives away a free copy of the "Berlitz Complete Guide to Cruising" for each review that meets its requirements. But their competitors accuse them of rebating from commission to come up with a lower price to attract the business, a practice that is frowned upon and considered to devalue the product by the cruise lines, but one that the lines claim they cannot take action against because European laws prevent them from determining the final selling price. Clearly, www.cruisecritic.com, which now has a UK equivalent in www.cruisecritic.co.uk, arguably offers a better cruise review site and the "Berlitz Complete Guide to Cruising," which cruise.co.uk ironically give away free, is a better and more independent arbiter of ships' ratings. Last January cruise.co.uk announced more detailed results that are worth examining in detail. With points out of 5, coming out best out of 20,000 reviews then were Seabourn (4.92), Oceania (4.48), Regent (4.37) and Cunard (4.36), in that order, and at the bottom of the list (some papers even called them the "worst cruise lines") were NCL (3.56), Costa (3.25), Transocean (2.97) and right at the bottom MSC (2.84). Interesting findings included the fact that Thomson (4.06) scored better than P&O (3.93). And coming out poorer than expected were Celebrity (3.93), HAL (3.91) and Azamara (3.65), all worse than Thomson and P&O, while Royal Caribbean scored better (4.15). Seeing as these are results from British clients it could be put down to a bias against American product, viz Carnival (3.70), but that does not explain Royal Caribbean being at 4.15 unless one considers that Royal caribbean did indeed have a major program running from Southampton, which has been continued by the "Independence of the Seas." MSC and Costa might have been a bit concerned at these results, but NCL did not stand out well either, something that may not be surprising as Freestyle Cruising has not always been fully appreciated. This may even have something to do with why NCL make a better return on cruises out of Venice than out of Dover. But again, there seems to be a little England bias against the Italian product as well as the Americans. Last week we talked about the cruise markets in Brazil, Russia, India and China. Within forty-eight hours of reporting Costa's addition of the Costa Romantica to its Chinese cruise opeation came news from Royal Caribbean that it would be sending its Legend of the Seas to China, with thirty-nine 5- and 7-night voyages scheduled from Hong Kong, Shanghai and Tianjin between February and November 2010.